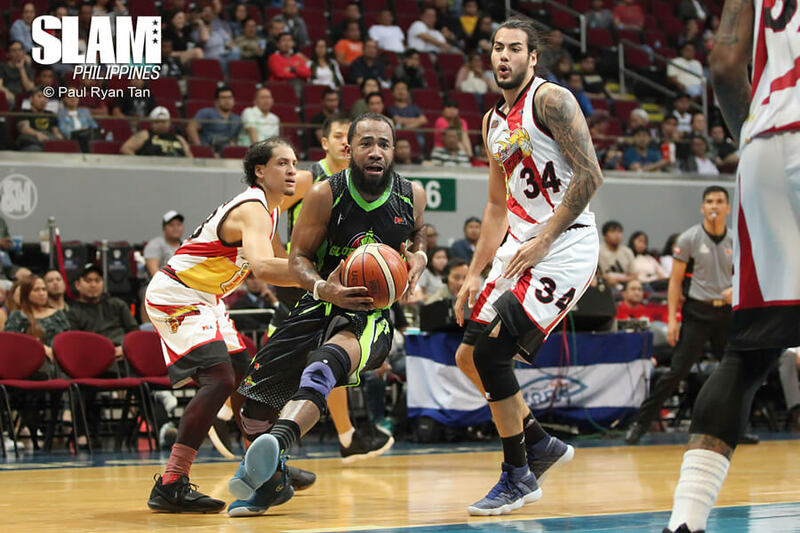 Even without an import, the GlobalPort Batang Pier were able to get back in the game and pull off a crucial win over the San Miguel Beermen. GlobalPort holds a 4-4 record while San Miguel falls to 3-4. Batang Pier import Malcolm White was ejected with a little more than eight minutes left in the game and the Beermen holding on to a six-point lead. With White gone, GlobalPort leaned on the production of Stanley Pringle and Nico Elorde in the end game to pull out the win. Pringle scored on a drive and assisted on an Elorde jumper to tie the game at 86. Pringle then gave the Batang Pier the lead with another strong finish inside a few possessions later. When the Beermen pulled even, he found Elorde for a three-pointer to give the Batang Pier the lead back. Renaldo Balkman cut the GlobalPort lead down to one point on two free throws. But he doomed his team with back-to-back turnovers that led to a Mo Tautuaa layup and an Elorde free throw to put the game away. Pringle came off the bench to score 22 points and dish out eight dimes. he scored eight points in the fourth quarter to lead the team without White. Elorde scored all six of his points in that crucial run in the final minutes. He also had five assists. White led the team with 25 points before he was ejected. 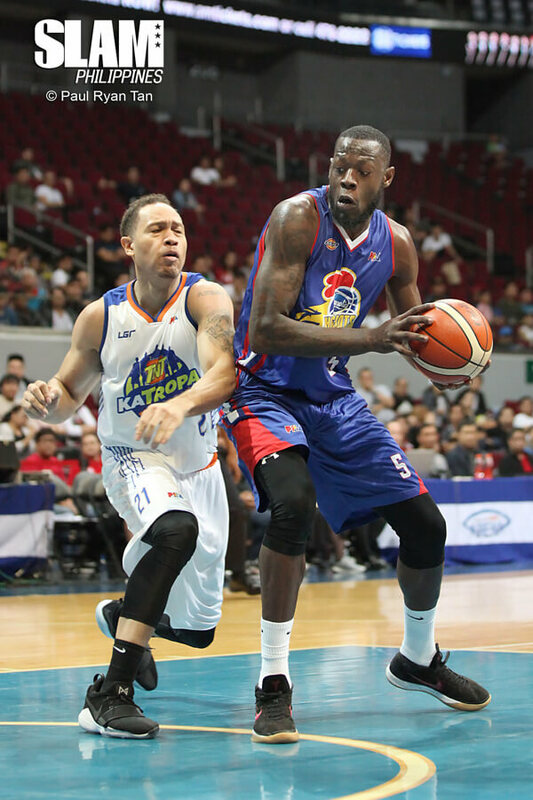 The Magnolia Hotshots badly needed a win after three straight losses. They got a big one over the TNT KaTropa to pull themselves back to .500 at 4-4. The KaTropa get knocked back in the standings at 6-2. Magnolia caught fire in the second half of the game as they turned a five-point halftime deficit into a six-point lead heading into the final period. That was when the flood gates opened and the Hotshots poured on the points. Rodney Brondial and Rome Dela Rosa nailed back-to-back three-pointers to increase the lead to double-digits. Jio Jalalon also came alive in the fourth period, scoring six straight points to give the Hotshots a 21-point lead. TNT was only able to cut the lead down to 17 points before one final run by Magnolia, capped off by buckets from Brondial, gave the Hotshots their biggest lead of the game at 24. The Hotshots found their offensive groove in this game. They scored on a clean 47% of their shots, including a 57% clip from the two-point area. They also had 23 assists as a team. Six players scored at least nine points in the game. Paul Lee came off the bench to lead the team with 25 points. Justin Jackson had 18 points, 19 rebounds and seven assists. Brondial stepped up with Ian Sangalang and Marc Pingris sidelined. He scored 16 points. Jalalon had 13 points and six assists.